Add the delicious taste of real meat and veggies to your precious pup’s next meal with Cesar Simply Crafted Chicken, Pumpkin & Parsley Limited-Ingredient Wet Dog Food Topper. Featuring real chicken as the first of only three simple ingredients, this wholesome topper will add paw-sitively irresistible variety to your dog’s dry kibble. Crafted with real foods and nothing else, it contains no artificial colors, flavors, fillers, or preservatives. And, it comes in convenient tubs with no-fuss, peel-away freshness seals, so it’s easy to unlock more shared moments of joy between you and your furry friend. 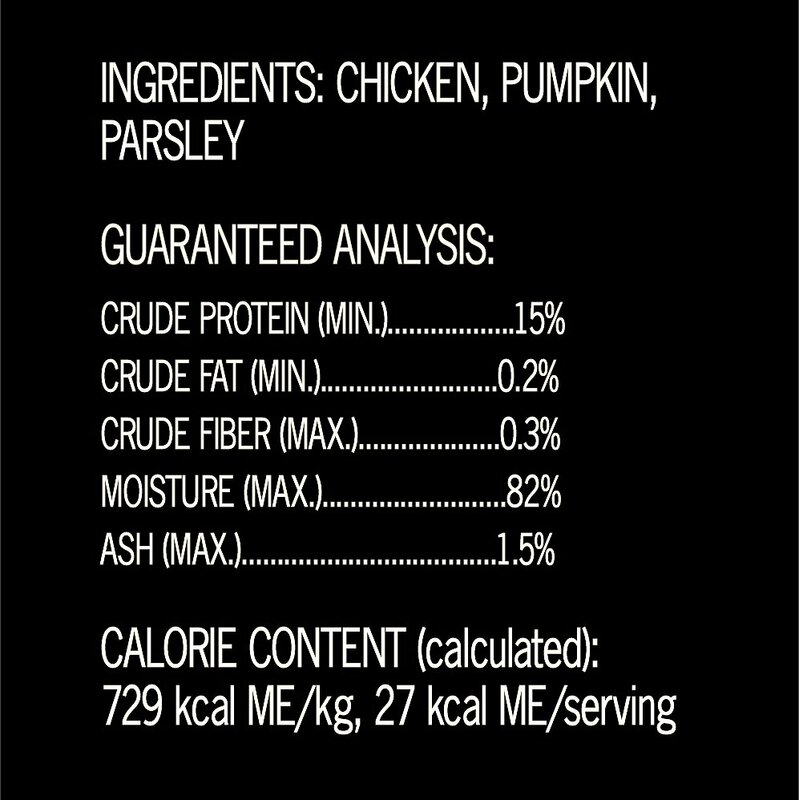 Contains only three ingredients–real chicken in natural juices, pumpkin and parsley for a delicious taste she’ll love. My dogs eat mostly home cooked foods. I;ve spent countless hours searching for products that are not filled with additives and undesirable ingredients. Three of my dogs have allergies and feeding them kibble does not work. Cesar Simply Crafted works for their bedtime snacks or as an addition to just a bit of kibble. LOVE IT!!!!! Our little dog is so hard to please where food is concerned. She would only eat two of Cesar's breakfast foods. We have left other types out all day and night and she will not touch them. Found ONE of the new Cesar's Simply Crafted on the grocery shelf, got home, opened it, she gobbled it up. Looked at all grocery stores around and found three more, no more. So, went to Chewy and ordered two flavors. One each day, she is getting slower at eating and enjoying. Have tried to slip some other types in, NO GO! She will not eat! You better believe I will stock up on the new Simply Crafted! Thank You, Cesar! My dog is a pretty particular eater when it comes to his dry food this helps give it more flavor and incises him to eat more of his dry food due to the bit of juice in the package. Hopefully he will enjoy other flavors of this too! Love Cesar topper. Few ingredients and no fillers. My babies love it. My Pomeranian is about a picky an eater as you can find, but she loves this! I took a chance buying this as she'd never had it before. And who knew Poms liked Pumpkin? Anyway, I will be buying this again. It's the only way I can get her to eat kibbles. I take a spoonful and put it over the top of her kibbles and it's all gone before I know it. I bought these to give as tiny snacks to my Yorkie throughout they day, but she wouldn’t touch it. Which, isn’t like her at all. She will usually eat anything in her dish, but not these. I used them as toppers for my doberman, he ate them without issue. Having recently rescued a little Pom; I was having trouble getting her to eat. 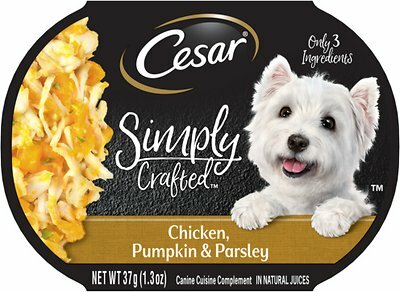 These Cesar Simply Crafted meals are fabulous. She's now eating dry food mixed in. Not a big hit with either of my dogs. Maybe because this version is very dry. However, it does come in handy when they have stomach upset or diarrhea - I just mix it with rice and their good to go.